Across the tropics, people worked out long ago how to transform fig tree bark into comfortable cloth—the practice could even predate weaving. In Uganda, such barkcloth has served as a symbol of protest, a form of money, and the exclusive raiment of kings and queens. It has been suppressed by religion, colonialism, and war, yet the tradition has persisted. And now barkcloth has found a new life as a source of local pride, as well as in international markets for home furnishings, high fashion, and even aerospace materials. It is creating jobs, and is entirely sustainable. It takes strength, stamina, and practice to make traditional barkcloth. The producers of this surprisingly soft and supple material first scrape away the outer bark of fig trees called mutuba (usually Ficus natalensis), then slit inner bark with a knife and peel it upward off the tree. They boil the bark in great pans of water to soften it, and then pound it for several hours with heavy wooden mallets until it is much, much thinner, wider, and softer. The cloth is dried in the sun, where it darkens to a ruddy brown, while the exposed trunk is wrapped in banana leaves for a few days to protect it as new bark grows, for another harvest. While myths and legends surround the origin of the craft, historians date it back to the reign of Kimera, who ruled Uganda’s Buganda Kingdom from around 1374 to 1404. Then, only royalty wore barkcloth, but as news of the product spread, demand—and prices—grew. In the late 18th century, King Ssemakookiro ruled that all his subjects must produce it. Trade flowed and the Buganda Kingdom grew rich. The felt-like fabric became more common, as an everyday cloth, worn as a wrap or toga-style, and for use in religious ceremonies and as burial shrouds. Farmers used it to pay land taxes. The emissaries King Muteesa I sent to London in 1879 presented gifts of barkcloth to Queen Victoria. But within fifteen years, Victoria’s empire had absorbed the land of barkcloth and folded it into the newly formed British Protectorate of Uganda. The colonial rulers had little use for the industry. They compelled farmers to produce cotton for English mills instead, stopped the practice of paying taxes in barkcloth, and banned traditional religion. Missionaries even called the fabric “satanic” and handed out imported textiles to discourage its use. 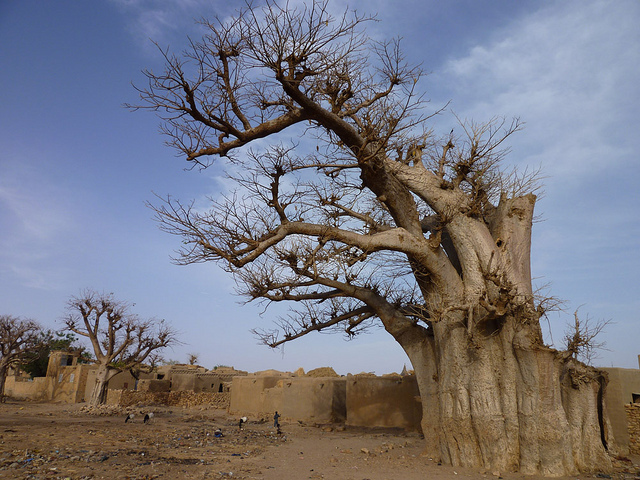 During World War I, the British felled more than 115,000 barkcloth trees to secure the border with German East Africa. Many skilled barkcloth producers had to emigrate. Nakazibwe says that those who stayed were compensated—but only after three years and what she terms a “painful process.” After the war, farmers began planting more barkcloth trees to boost yields of coffee plants with their shade, but when the British conscripted all local men under 45 to serve in the military during World War II, barkcloth production ground to a near halt. Woven textiles had come to dominate the market, but a new role awaited barkcloth—it became a symbol. In 1953, when the British arrested King Muteesa II and sent him to England, many people began wearing the cloth again to express loyalty to the king and anger at the colonial administration. When he was finally allowed back in 1955, his supporters erected barkcloth-covered arches emblazoned with triumphal messages, and waved barkcloth banners along the 19-mile route from the airport to his palace. 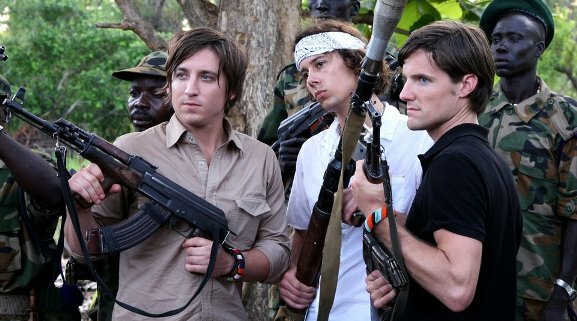 Seven years later, Uganda gained its independence. In the following decades, the barkcloth industry rode waves of political crisis, dictatorship, civil war, and the end of the institution to which barkcloth was most closely tied—the subnational Buganda monarchy, its original patron. When it was restored in 1993, the new King Ronald Mutebi II wore ceremonial barkcloth at his coronation. The festivities entailed widespread use of barkcloth throughout the kingdom, sparking renewed interest in the material. A new wave of artisans now fashion barkcloth into clothes, shoes, and bags. Designers have turned it into wallpaper, lampshades, and furniture. Zandra Rhodes shaped it into haute couture. Architect Zaha Hadid called it an “exceptional material.” And when the leaders of the G7 nations met in Germany in 2015, they did so in a room with walls covered in decorative barkcloth. That barkcloth was supplied by Ugandan-German couple Mary Barongo-Heintz and Oliver Heintz, who have been in the business since 1999. They found early in their enterprise that the cloth itself is just the start—it can be dyed, rubberized, bleached, or hardened. By blending it with other materials, they could make it water repellent, fire retardant, or abrasion resistant—presenting a range of alternatives to leather or synthetic, petroleum-based materials. “Money really does grow on trees,” says Heintz. His company BarkTex now sources barkcloth from 600 small-scale farmers in Uganda, and employs 50 more local people to upgrade the barkcloth, with priority given to women. “Many of our women workers earn an income far higher than their husbands,” says Heintz. But under some traditional rules, women can be frozen out of the industry. In Baganda culture, the barkcloth tree symbolizes male power and ownership of land, and it is taboo for women to plant the trees. The Center for International Forestry Research and the Association of Uganda Professional Women in Agriculture and the Environment have now helped 50 women negotiate with their husbands to allow them to plant barkcloth trees. It’s a small move, but a start. Heintz estimates that at least 500,000 farmers in Uganda could provide bark, with their income benefiting roughly 4,000,000 people. There are broader benefits. The trees store carbon. Their leaves provide fodder for livestock, their figs help sustain wildlife. Barkcloth production requires little energy or water and is carbon neutral. This post was first published by Atlas Obscura, here. 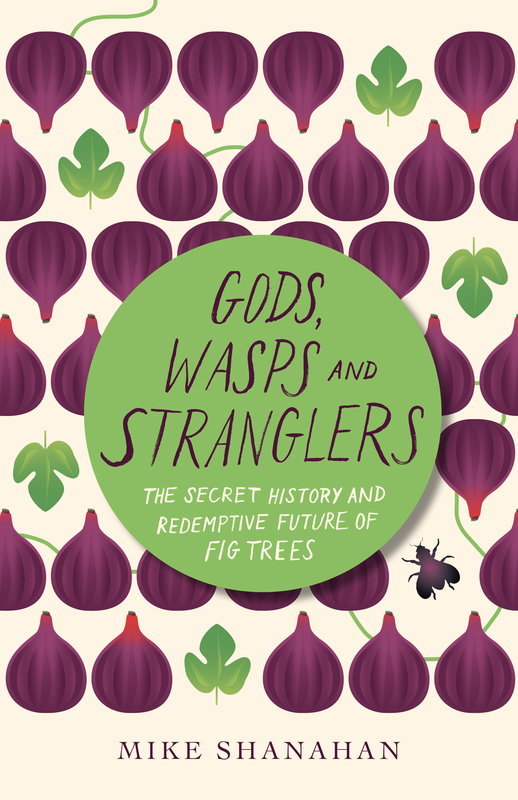 Read more about how fig trees have shaped our world, fed our imaginations and can enrich our future in my book Ladders to Heaven (called Gods, Wasps and Stranglers in North America). Nyamweru, C. & Gombe, C. 2006. From coronation robes to car seat covers: the changing uses of Ugandan barkcloth. Kenya Past and Present 36: 53-58. Nyamweru, C. & Gombe, C. 2007. The story of barkcloth in Uganda: An ancient craft in modern times. Old Africa. October-November 2007: 10-13. Nyamweru, C. & Gombe, C. 2012. Barkcloth in Uganda: The modern day importance of an indigenous craft. 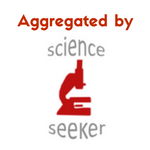 Lambert Academic Publishing. In 2010, I walked in parts of Mali where now the threat of violence dogs people’s daily lives. I loved every place I visited, but it was the mystique, peace and beauty of the portion known as Dogon Country that touched me most. 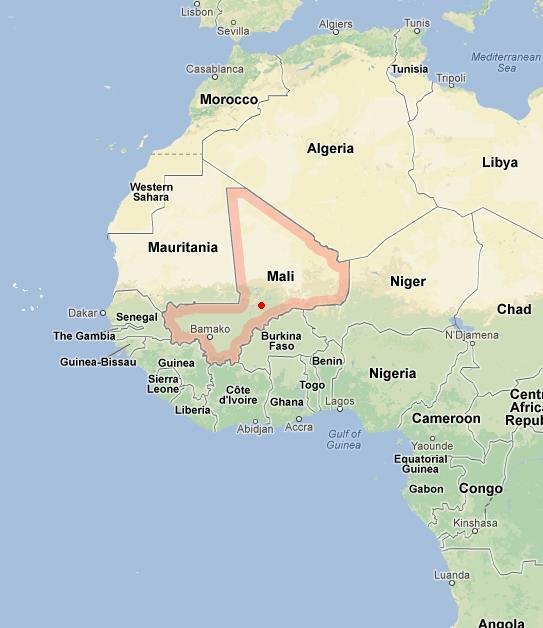 It is a remote region near the middle of Mali, which itself lies landlocked at the heart of the hump we call West Africa. 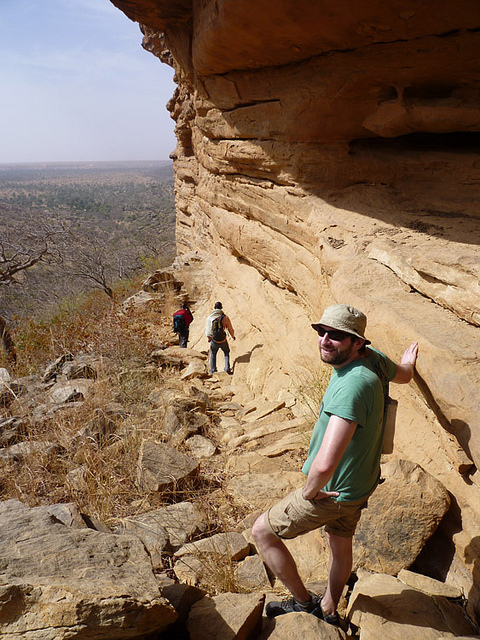 A sandstone cliff — 200 kilometres long and up to 500 metres high — divides the Dogon territory in two. 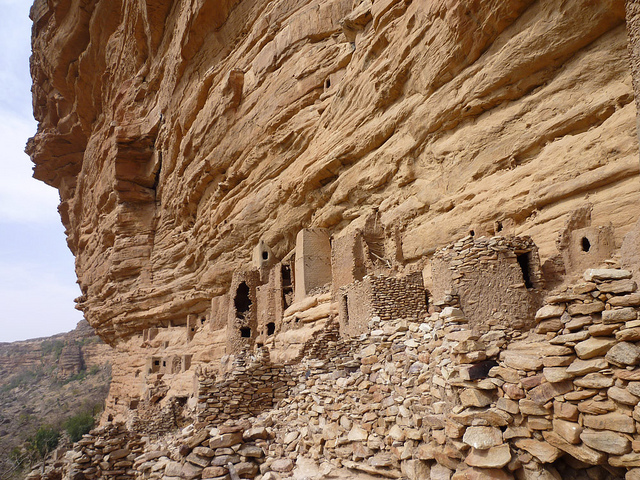 Some of the Dogon people live atop it in the Bandiagara Highlands while others live on the Séno-Gondo Plain down below, or in villages that huddle in a line at the base of the cliff itself. 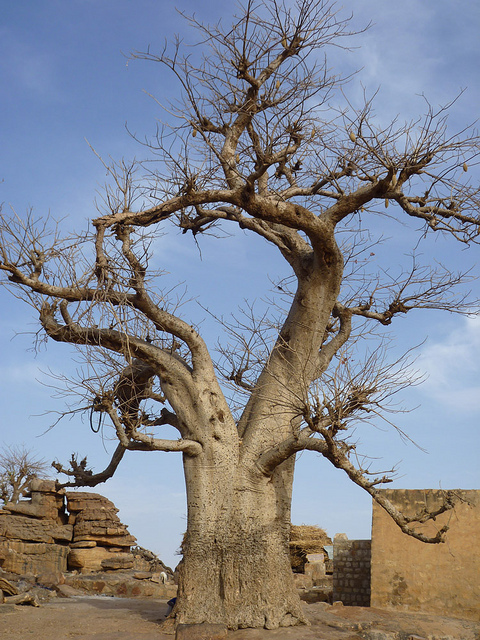 My walk between these distinct worlds started in Sangha, a highland commune of mud buildings and massive baobab trees like this one. Even strong men look weak in their company. In the wilderness beyond Sangha stood a trio of elders who provide people with advice about problems or changes in their lives. To do this they seek the help of a sacred desert creature — the pale fox (Vulpes pallida). First the men use a stick to scribble symbols in the sand to represent a client’s questions and possible answers. Then they scatter peanuts over the marks they have left and go home for the night. After the sun sets, there is a good chance that a fox will come to eat the nuts. The next morning, the elders check which answers the fox has left its footprints on — and that is the advice they give. 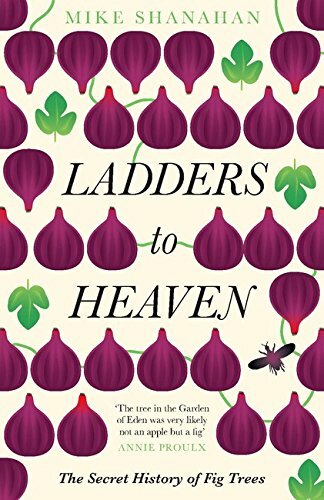 In the village after Sangha — a small place called Bongo — the air was ripe with the sweet scent of onions that grew in green fields all around. They became a cash crop in the Dogon Country in the 1930s when French colonists created a demand for them. When the onions are full grown their farmers pound them into a paste, which they then roll into balls to dry in the sun. In the past these fragrant spheres served as currency. Today they sell in distant markets and are a vital source of income in this poor corner of a poor country. After Bongo — where children had filled the air with songs — the landscape became a place of peace. The silence was stunning. Even birds seemed shy. Yet more than 120 species of them live here. 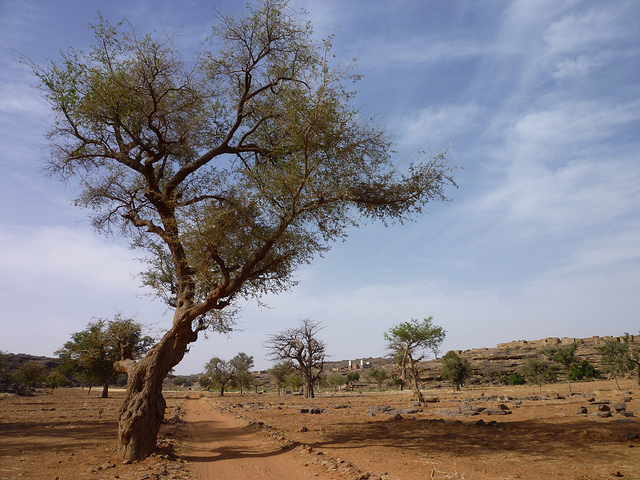 The plateau is also home to over 300 plant species, many of which are hard to find these days in less remote parts of Mali. To reach the Dogon villages on the plain, I clambered over rocks along an ancient path that hugged the face of the cliff. That’s Burkina Faso in the distance across the plain. The Dogon people migrated to this area in the 1400s from their homeland far to the South-West. When they arrived they found another group of people called the Tellem living in caves on the cliff. Little is known about these “little red people” and it is not clear whether the Dogon killed them, chased them off or assimilated them into their own society. According to Dogon oral history, the Tellem people could fly, and that’s how they built structures like these high in the cliff face to store grain and house their dead ancestors. 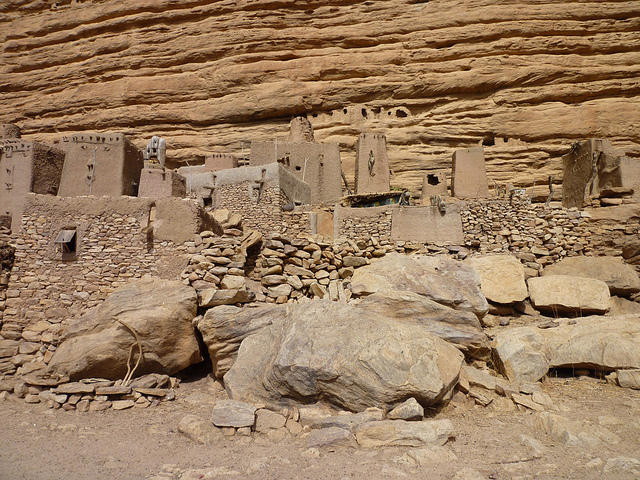 The picture below shows a Dogon village that sits at the base of the cliff, beneath the older Tellem structures on the cliff face. 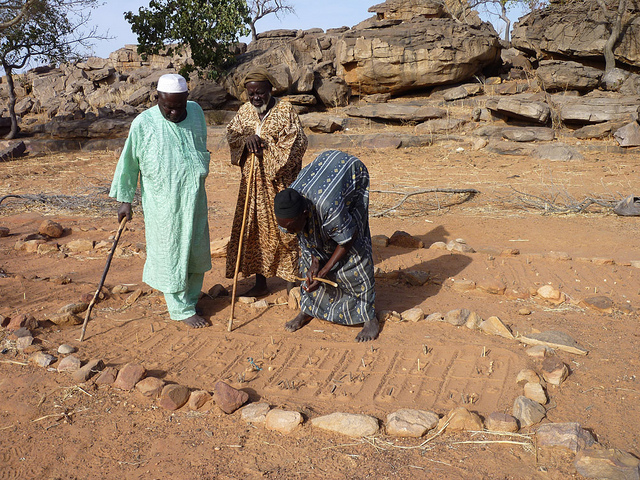 The Dogon people migrated to this place because they didn’t want to convert to Islam. 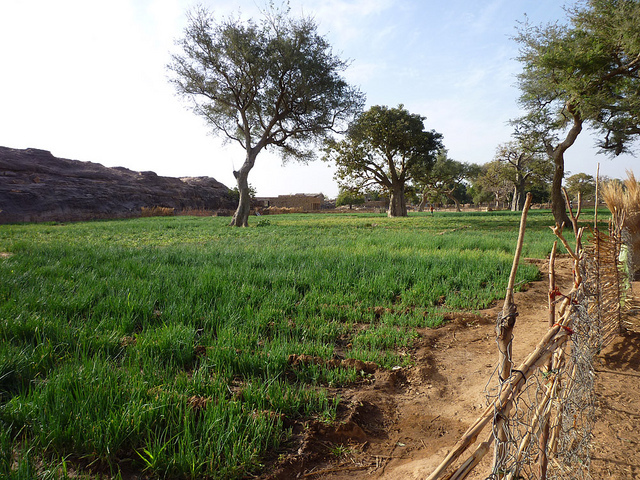 When France colonised Mali, the Dogon people again hid and resisted change (apart from adopting onions, that is). Their animist culture survives in part thanks to the remote landscape they chose to call home. Three years ago when I walked in Mali I felt only safety. Today it is a place where danger lurks. Cowards with guns threaten good people for making music, sending girls to school or simply believing in another god. The old men and the pale foxes may not have foretold this but the Dogon have seen it all before.